Founders should work hard at engineering the best corporate DNA they can. Most of the founders at our incubator Ben Franklin TechVentures have not interviewed, selected or onboarded new employees prior to launching their startups. Having incubated more than 150 companies in 30-plus years, we’ve seen hundreds of successes and failures in hiring. It’s an essential step towards success. As you may remember from reading my last couple of posts, all startups have their own idiosyncrasies and don’t lend themselves to rigid rules. So, instead of another “how to hire your first employee” piece, I’ll instead offer some higher-level advice that might lead to better decision-making. If you stood side-by-side with your great-great-great grandfather, an observer could probably see a resemblance. That’s because some of his genetic makeup has become a part of you. This is how it is inside a growing company. If you’re the founder, you hire the first person. Then you and that person hire the third person. In fact, you’re probably involved in hiring each new person through about employee number 30. But as your company grows, you will become less involved in the hiring process. Employee number two might choose employee number 31. But because you hired employee number two, that person hopefully resembles you in important ways: temperament, communication style, etc. Meanwhile, that employee number 31 probably resembles number two, and so on throughout a company’s evolution. Even after the founder is retired, there is a genetic culture that creates the core DNA of the company. Below are a few practices we’ve seen that help companies go through a more successful hiring process and build a great lineage. 1. You should even codify it in a company culture document that changes as you grow. A great example is the 2009 Reed Hastings PowerPoint deck on Netflix culture. 2. Write professional job descriptions. If you’re not sure how to do this, use this Monster Jobs link to help. While informal networking and reliance on your relationships will expose you to good candidates, using formal search processes will identify excellent, unexpected candidates. It will also build discipline, helping your company hire people in the future when you’re no longer directly involved. 3. Don’t wait for a job opening to meet candidates. Keep a link on your website that talks about your company and how you’re always looking for candidates in broad fields (programming, for instance). Forcing yourself to take interviews — even when you haven’t decided if you’re going to hire — helps you learn what you’re looking for, keeps you current on who’s available, and will make you better educated when you do have a decision to make. 4. Don’t hire a manager when what you want is a doer. Over the years, many startups in our incubator have hired former senior corporate people, especially for sales positions, because the person has a strong set of contacts. “Former EVP of Marketing at IBM” sounds pretty impressive as your Chief Marketing Officer. But that probably means they spent their day managing 100 people and not actually engaging with customers. Within a month or two, they will have approached every one of their contacts…twice. Results will probably be mixed because your startup is not IBM. If you’re trying to ramp up your business from its first five customers to its next 50, this senior management person probably doesn’t have the skill set nor inclination to do what really needs to be done. They won’t be happy or good at banging away at email responses, running product demos or making phone calls. It’s OK to hire a less-pedigreed person if the job and culture is a better fit. It’s hard to build a successful tech company. It’s virtually impossible to do so with an undisciplined and poorly thought through description of what you want your company culture to be. Think of your business as a living thing and realize that each person who gets hired may become a critical chromosome in your company DNA. Pitching Big or Pitching Small? Ralph Kramden, pitching his “Krammar’s Delicious Mystery Appetizer”….and pitching it big. Ralph Kramden was always pitching BIG. There must be a dozen episodes in which he dreams up a new way to make a financial killing. And when he pitches those ideas to his pal Norton, or as in the picture, to his boss Mr. Marshall, he’s pitching them big. He never seemed to struggle with the presentation issue that many founders face when putting their investment story together: Should you pitch big or pitch small? These are probably all lies. Even if there is a kernel of truth in them, the founder who would utter these kinds of things out loud and dedicate space to them in a powerpoint may be suffering from what I’ll call here FIDOS…Founder’s Irrationally Delusional Optimism Syndrome. It’s a dangerous condition for founders because it indicates a clinical inability to sift out legitimate opportunities from real opportunities. Presentations of this type reveal that the founder is more dreamer than do-er. They seem to believe that the only things that matters to most early stage investors are big, big promises when, in fact, it’s the little promises that matter most. I’m not suggesting that you don’t tell me about the overall market opportunity. I need to know and understand what you think your total addressable market is, but described in a bottom-up, rationally segmented manner. And I want to understand how fast that market is growing. But more important than that is what have you already done, specifically, to validate that market? Evidence of potential customer interactions, like those above, may be great, but I’m going to want to understand the steps that have been taken to this point to elicit those responses. If all you have is “we’ve had one conversation” then it is way too early to include this kind of information in your powerpoint. More important to me is to understand what you are going to do in the next 12 months to move those opportunities forward. How are you going to execute on the small stuff like…getting the prototype done, generating cash to keep the company alive, finding great team members, generating awareness and an early growing pipeline for your product. Pitching small to me means demonstrating you have an eye for the boring details of daily execution over the upcoming short period of time. Pitching small means you have an appreciation and fear of the many pockets of risk that exist in your startup. Investors need to believe there is a big opportunity out there, but I don’t think most of them are investing based on it. They’re investing based on you and your execution plan. 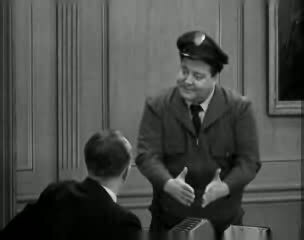 The Ralph Kramden character in the Honeymooners was a bus driver. Daily, his roads were well mapped out for him. The details of getting to the next stop were mostly figured out for him and so his FIDOS condition was pretty understandable. As a founder, however, you’ll need to make dozens of decisions each day and each little decision has some level of impact on your ability to reach the big destination. In your investment pitch, you need to have a vision and be able to articulate it quickly. But early potential investors know that the road to achieving your dream will encounter countless forks, none of which are marked with signs pointing the way to that dream. Your “pitching small” presentation needs to prove to me not that you already have all the answers, but that you are a great navigator, capable of drawing your own map to get to each stop on the way. Good example of a bad powerpoint slide…but if you MUST use something like it, at least reveal it in pieces, over the course of multiple slides instead of all at once. Many have wished for and striven for the death of the powerpoint presentation. I have always disagreed with this point of view. There is no doubt that most power point decks are terrible and yes, should be killed. However, it isn’t “Power Point” that is the problem, it’s the author! Power Point is a fine canvas to use to tell the story of your venture. Just do it right and it will not be painful. Lots of founders have asked me over the years to create a template for an effective investor power point. And, having yet again sat through one of the worst I’ve ever seen last week, I decided it was time to finally do it. However…do not just rush off to the attached template! Take a quick look at some of my recommendations below first…and then rush off to the attached template. I even stuck the link to the template AT THE BOTTOM of the page so you have to at least skim through the recommendations first! 1) Most investors have a relatively broad level of technology and industry knowledge, but their depth in any given technology or any given industry will not be as deep as yours. If they can’t keep up with your presentation because it provides too much technology detail, or too much acronym-laden jargon, that is YOUR fault not theirs. Your goal is to present your BUSINESS PLAN, not your technology. 2) Put yourself in the seat of the viewer/listener. This is not a lecture where you are trying prove how smart you are or educate your audience about how some novel technology works. You are trying to convince investors that you have a plan to generate sales and profits by selling things of value to a given group of customers. Tell a story…don’t give a lecture. 3) There is a difference between a “presentation” and a “performance”. Many demo days and pitches to audiences should NOT follow the format I’ve suggested. Basically, if you are going to be 1) on a stage and 2) literally have a spotlight on you, you need an image-rich group of slides with almost no text at all. These are more “performance” than “presentation”. Think, TED talk type…don’t use the attached for that. If instead, you have more of a “meeting” oriented session with a smaller group of attendees, the attached “presentation” format should be a fair guide. 4) Use 2 minutes per slide as your guide. I don’t mean “about 2 minutes” per slide. I mean absolutely NOT more than 2 minutes per slide. Under any circumstance. This means if you have an investor meeting in which you’re given “about 20 minutes”…10-15 slides is your max, with some slides obviously less than 2 minutes. 5) My opinion is that the emphasis of every investor presentation should be oriented more on customer segments than on your product. Businesses exist to deliver value to customers, not to simply develop technology. I know, I know. The truth is that you very well may have developed your technology with only vague thought as to the market to target. If that’s true, then lie to me. Tell me you first understood a market need and THEN developed the technology to address it. 6) When you’ve prepared your slides, rehearse them numerous times. The most important thing is to use the slide as a queue, not a crutch. Do not read content…do not worry about saying the exact words that are on the screen. Your discussion should be more or less summarizing what the very few words on the screen also say. 7) Some slides work well if they are revealed one piece at a time. For example, if you have a slide with a graphic that summarizes your sales pipeline, and you have, say, 5 major elements of that graphic, break the single slide into 5 with each slide in the series adding another section of the graphic until slide 5, when all the pieces are visible. This way, the viewer/listener can view and listen at the same pace you’re talking! 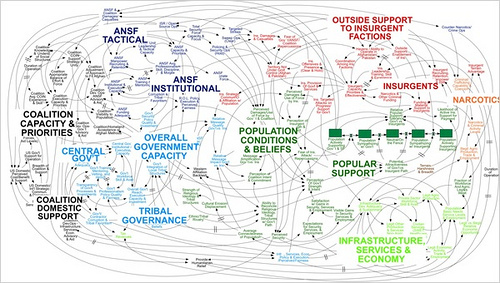 If you dump a complex graphic on the screen all at once (see the picture! ), the viewer in us tries to take it all in while the listener in us is getting only information on on the first piece. This may add to the number of slides in your deck…but some of them will go much faster since you’re showing pieces of the whole. 8) When you’re done…look at each slide individually. If you are sitting in the back of a darkened room with no to only-moderate knowledge of the subject and a hundred other things in your day to think about, is the slide comprehensible. Be honest! We’ve ALL sat through terrible power points. Remember what made them terrible and work to avoid the reasons why they were terrible. I mean it…look at each slide on its own! Thanks for reading through those tips first! Feel free to email or comment if you have a question or challenge to anything above or anything in the template!